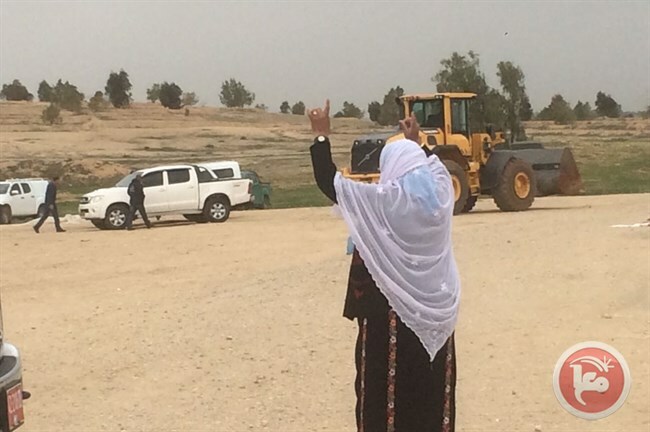 NEGEV (Ma’an) — Israeli bulldozers demolished the unrecognized Bedouin village of al-Araqib in the Negev desert in southern Israel for the 142nd time, on Thursday. Locals reported that Israeli bulldozers, escorted by Israeli police forces, demolished residential structures and tents of al-Araqib villagers, leaving women, children and the elderly without a shelter. Villagers said that they insist on remaining in their village, adding that they will keep re-building their village. The Israeli demolitions of al-Araqib are carried out in attempts to force the Bedouin population to relocate to government-zoned townships. These “unrecognized” villages were established in the Negev soon after the 1948 Arab-Israeli war following the creation of the state of Israel, when an estimated 750,000 Palestinians were forcibly expelled from their homes and made refugees. Now more than 60 years later, the Bedouin villages have yet to be legally recognized by Israel and live under constant threats of demolition and forcible removal.